The Obama administration is looking hard at pushing through a health care reform bill without Republican backing, top Democrats close to the White House told CNN. White House officials are beginning to lay the groundwork for such a move, telling CNN that they’ll have to take drastic measures if there’s no movement. 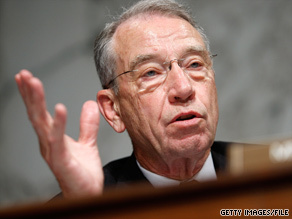 Sources from the administration and the Democratic side of Capitol Hill have told CNN that they’re becoming increasingly convinced that Republicans — particularly Iowa Sen. Charles Grassley — involved in the negotiating process aren’t serious about striking a deal. Grassley is one of six members of the Senate Finance Committee — three Democrats and three Republicans — negotiating the only bipartisan health care legislation so far. The six negotiators are not considering a government-funded public health insurance option favored by President Obama and Democratic leaders but are looking at nonprofit cooperatives that would negotiate collective polices for members. Grassley warned at a weekend town hall meeting that the months of negotiations may fail to produce a bill he can support. If Democrats choose to go it alone, the public health insurance option is likely to be back on the table because there would be no need to win the votes of Republicans or conservative Democrats. But it would be a change in tactics after the White House appeared to shift its stance on the issue over the weekend. On Saturday, Obama said the “public option, whether we have it or we don’t have it, is not the entirety of health care reform.” Then on Sunday, Health and Human Services Secretary Kathleen Sebelius said a public option is “not an essential element” of overhauling the health care system. Their comments were interpreted in media reports as a softening of the administration’s support for the public insurance option. However, Sebelius denied Tuesday that anything had changed in Obama’s policy. “Here’s the bottom line: Absolutely nothing has changed,” she said at a Medicare conference. “We continue to support the public option. That will help lower costs, give American consumers more choice and keep private insurers honest. If people have other ideas about how to accomplish these goals, we’ll look at those, too. But the public option is a very good way to do this.” Earlier, White House Press Secretary Robert Gibbs said Obama and Sebelius have consistently called for making health insurance affordable to all in a competitive market, and that they think a public option is the best way to do so, but were open to other ideas.